You’ve never heard of MEGALITH? Change that soon! This is Gothic Death/Black Metal in its most ambitious and challenging form. But apart from Gothic Death or Black Metal there are also some Neue Deutsche Härte influences and some elements of Folk and Neo-Classical music, adding up to an extremely manifold sound. The look of the CD and the opulent booklet (28 pages!) give a perfect impression. Apart from all lyrics there are also quotes by influential individuals to every song. Amongst those individuals you will find Nietzsche, Tolstoi, Kafka and Heine, but also the Inuit or Noah Seattle (an Indian chief born in 1786). Not an easy listening experience? Yes and no. I would describe “Gipfelstürmer / Storming the Summit” as challenging. There’s a lot of substance and intelligence behind the German lyrics, which were inspired by all these poets and writers. There are also longer introductory texts on Heine, Kafka and Noah Seattle to be found in the booklet. But all professional presentation is of no use, if the music doesn’t convince. But in the case of MEGALITH, the music certainly is just as convincing! MEGALITH are the band of the former AGATHODAIMON guitar player Hyperion. Some similarities still exist, so fans of AGATHODAIMON should also like MEGALITH. But the sound of MEGALITH is much more varied and avant-garde than the sound of AGATHODAIMON. I often was reminded of the German band DESOLATION. But musically MEGALITH actually lie somewhere between all styles of metal, and that is just how it should be! The last purely unplugged track “Aufbruch in die dunkle Nacht” (A Dark Night Lies Ahead of Us) could agree to fans of medieval-metal bands such as IN EXTREMO or SUBWAY TO SALLY as also to fans of the Gothic band SAMSAS TRAUM. But most of the music belongs to the Gothic Death and Black Metal realm. The gothic-classical intro to the opener “Zukunftspläne” (Plans for the Future) is a nice introduction to this CD, then the song begins to groove with a powerful beat to which the rough vocals of Orpheus match perfectly. Quite comparable to SAMAEL’s “Ceremony of Opposites” album. Generally, fans of SAMAEL should buy “Gipfelstürmer” instantaneously! The following title track goes in the same direction. The excellent sound completes the perfection of this Album. With “Deutsches Herz” (German Heart) MEGALITH included a song with a great hit-potential. Melodic, but nevertheless aggressive and great for dancing. This song might shake countless bodies in countless discos! The clean vocals are great too! With “Der einsame Jäger” (The Lonely Hunter) MEGALITH go a little too deep into the solemn SAMSAS TRAUM sphere and only prevent themselves from getting lost by including a few hard parts. MEGALITH sound decidedly more convincing when blasting through their songs, as in the following “Die Geier” (The Vultures) which begins with a sample from “The X-Files” and turns into a high-speed banger with a black metal feeling and atmospheric keyboards. Certainly something for the headbanger-fraction in the regional discos. The next song “Wir lieben den Tod” (We Love Death) alternates between acoustic sounds and powerful grooves and is politically quite extreme. It is a direct anti-US-war-song written out of the perspective of martyrs from the Middle East. Fittingly, the song is accompanied by a Chomeini quote. An interview should clarify whether MEGALITH really are taking a stance for the martyrs. “Eines Tages” (Sometime in the Future) also includes a lot of Black Metal passages, while “Ein Traum von Ende und Anfang” (A Dream of the End and a Beginning) has almost no heavy guitars. “Die Brücke” (The Bridge) is written out of the perspective of a bridge and again reminds of old SAMAEL, but is not quite as convincing as the first half of the album. The next song “Das Tor” (The Gate) has a very dramatic structure and is to be seen in relation to the very tasteful cover. A nice song with a SUMMONING-touch, good for a close listening, but not so much to go amok. Quite contrary to “Schämst Du Dich nicht?” (Aren’t You Ashamed?) based on Black-Metal riffs. “Schämst Du Dich nicht?” is a really intelligent anti-Christian-God song, ranking high above the typical satanic on-the-nose anti-Christ tirades which are so frequent in the Black/Death Metal scene. After the last track “Aufbruch in die Dunkle Nacht”, which I already described in the beginning, two bonus tracks complete this album, of which especially the first one has turned out great: A “March ör Die” MOTÖRHEAD-cover in a MEGALITH-pimped version. So to say “Lemmy goes Gothic-Black”. Courageous and great! “Trail of Tears” is then finally an acoustic guitar version of “Aufbruch in die dunkle Nacht” with English lyrics and a different message. Conclusively, this is a rare jewel among underground music! I have no idea whatsoever why no big label has so far signed this band. But who cares?! As long as MEGALITH are able to produce such a great piece of art by themselves, no big labels are necessary. Probably they would just mess up MEGALITH’s concept. All fans of the above mentioned styles and bands should order “Gipfelstürmer” immediately! The info-sheet states: „MEGALITH are the new band of the ex-AGATHODAIMON guitar player Hyperion. While AGATHODAIMON play relatively traditional Gothic-Metal, Hyperion progressed into a more avant-gardes and experimental direction. Without sounding arbitrary or incoherent, MEGALITH successfully combine elements of Black-, Heavy-, Gothic- and Folk-Metal, add a few impulses of Neue Deutsche Härte and take excursions into the realm of neo-classical music." Yes, that sounds quite right, nothing in there I need to correct. But now we should focus on the music. Hyperion already provided us with the basic facts. Of course, such a mix can easily end badly. Firstly, it can be a bad economic decision for a band to position itself between all genres. Secondly, because such experiments often sound forced and fabricated. Sometimes they make the impression that a band wants to make money by offering something for everyone. Of course, both dangers are connected. If a band is good at composing, the result sounds coherent and raises no suspicions. And exactly that can be said of this experiment: The mix sounds very accessible, even though it features so many aspects. The best surprise is that this stylistic chaos sounds absolutely logical and playful at the same time. But admittedly, all genres are connected in some way, so a mix even more daring would be quite possible. Still, a band really has to be very good at composing to let such a mix sound natural. And this band obviously is very good at it. Accordingly, these many stylistic elements really are avant-garde in the truest sense of the word: progressive (many of today's avant-garde bands are not progressive at all, but rather sound like the traditional avant-garde of the late 80s). On the one hand, it is absolutely brilliant what happens here. MEGALITH are at their very best in their symphonic-gothic and the neo-classical moments as well as during the folk-parts. One great melody follows the next as if they had too many of them in storage. The riffing is good too. The powerful and crystal clear sound makes a great impression. Drums and bass sound mighty. Everything's great. Even when the music takes up pace and black metal riffs race forward the sound remains transparent and powerful. Up to here, I would give this album 9,5 of 10 points. But one could (or should) add another style to the long list of styles mentioned above. MEGALITH have a declamatory and elevated style typical for singers and songwriters and sometimes also for German Medieval-Rock bands, and I always found that embarrassing in some way. The vocals are divided to equal parts into Black Metal growling and screaming and clear vocals. Both doesn't absolutely convince me in this context, although the rough parts don't really bother me, they merely take a little power from the great compositions. But the clear vocals are a real problem. I don't know why it always sound embarrassing when we Germans use our elevated German, but at times the surprisingly good lyrics don't make the impression they could due to the way they are presented. There are only two English tracks on the CD, both are bonus-tracks. First MEGALITH cover MOTÖRHEAD's "March or Die" – astoundingly varied, astoundingly brilliant. Then they finish with "Trail of Tears", an acoustic-version of one of their own songs. Musically, this last track certainly isn't one of the best songs an this album, but on "Trail of Tears" the clean vocals sound great. MEGALITH's vocalist doesn't lack a good voice, but the declamatory style of the clean vocals sometimes just is "too much" for me. In spite of this slight criticism of the lyric's presentation, the lyrics themselves have to be mentioned as a positive aspect. To put it broadly: MEGALITH are concerned with a phenomenon that Niklas Luhmann calles "incoherent Perspectives". The band's opinions often are not politically correct. Luckily, they don't provoke just for the sake of provoking, but rather to make the listener think for him-/herself. About time that a band doesn't just propagate incoherent perspectives, but also puts them into practice. Examples: They quote Chomeini positively and at the same time compliment the Yankees patriotism. They criticize the German self-pity and the German's inability to act instead of just complaining, and at the same time they promote German identity. Those are intellectual exercises that are hard to undertake. It really is refreshing to hear German lyrics, sometimes also with political content, that go beyond the standardised and worn-out paths of thought. Sytlistic, concerning metric and rhyme, the lyrics can not always keep up with their ambitious content. Also the combination of vocabulary and grammar is sometimes of a peculiar style that can not always be excused by the irony and sarcasm of the lyrics. Inspite of these two quite unimportant and minor points of criticism it is quite impossible to review this release with less than 8,6 (let's say 9) of 10 points. This album contains too much work, too much heart and soul, and too much intelligence to give it less. In addition, the result is simply too varied, too powerful, too brilliant. To bang and to think simultaneously – a new extreme sport that listeners of the genres mentioned above should definitely try. Author: Dirk-Bengt. 9 of 10 points. It must be one of the oddities of Metal that some bands are looked at funny, when they sing in their own language and actually everybody is able to understand the lyrics. Mainz-based MEGALITH are one of these bands and they have stirred up quite some controversy over the years due to their at times a little provocative German lyrics, but it would be far too easy to just nail them down on this, because there is far more to this band than the surface. Once you start to dig a little deeper, you will find that the lyrics actually are some of the best Germany has to offer, deep, often taking on a philosophic stance and at times ambiguous, making it truly worth it to read along and get behind the meaning of them. When looking through the booklet and actually reading the lyrics, the names of Kafka, Heine, Nietzsche and the likes come to mind and also are quoted, showing that Hyperion’s lyrics are not aimed at sheer provocation and a public outcry, but actually have more than just one dimension. Best example for this is “Deutsches Herz”, (“German Heart”)which at first look seems aimed towards right-wing politics, but upon closer examination the lines “ganz ergeben der Schrift und dem Wort“ (“devoted to writing and the word”) and “Taten komplett aus dem Denken verbannt“ (“having banned deeds completely from thinking”) show that the “German Heart” is nothing like that. But I do not want to ride around on the lyrics for too long, let’s leave it at the fact that they are provocative sometimes, but have philosophical depth galore and are excellently written. Now on to the music and here the sextet continues to explore the grey zone between aggression and pomp, combining elements from Black, Gothic, Folk, Heavy and Modern Metal into a highly interesting cocktail that should appeal to a fairly wide array of fans, even if they have no idea what the heck Orpheus is rasping or singing about, if you can deal with a fair deal of keyboards that is, because this instrument plays a pretty big role in several of the songs. And whereas “Zukunftspläne” (“Future Plans”) is more aggressive and fast, the already mentioned “Deutsches Herz” is a stomping mid-tempo track that has a light RAMMSTEIN feel to it, but for the first time shows the excellent clear voice of Orpheus, providing an interesting counterpart, so a song that is worth exploring deeper in the lyrical department doubles it up with being equally interesting musically as well! “Der Einsame Jäger” then shows a completely different side of MEGALITH, introspective and painting a rather bleak picture of “The Lonely Hunter” of the title, a lone soul out in the world, vainly trying to connect with people surrounding him. Musically piano and keyboards together with the clean vocals are the main participants and once more the music perfectly complements the lyrics, making this album often seem like a theatrical and philosophical affair than just a mere musical production that I could very well see on a theatre stage as well, which definitely is part of the great appeal “Gipfelstürmer / Storming The Summit” has. That musical variety is not a stranger with MEGALITH, though, is further enforced by “Die Geier” (“The Vultures”), where intense, brooding passages go hand in hand with fast eruptions and hammering double-bass, creating some great dynamics and the playful acoustic guitar amidst the harsh atmosphere of “Wir Lieben Den Tod” (“We Love Death”), which is another highly interesting piece, which lyrically touches down on religious fanatics that will choose death to become part of god’s realm. “Das Tor” (“The Gate”) with its big orchestral keyboards reminds me somewhat of LAIBACH and “Aufbruch In Die Dunkle Nacht” (“Embarking Into The Dark Night”) is a goose-bump inducing closer that is as dark and oppressive as the title suggests. And whoever wondered how MOTÖRHEAD’s “March Ör Die” sounds symphonic, then you will be able to check it out, as MEGALITH give it a little remodel, which shows that good songs will work in (almost) any style, the militaristic/symphonic style also sounds like something the Slovenian avantgardists of LAIBACH could have come up with (as they have a history of unusual cover versions themselves)! 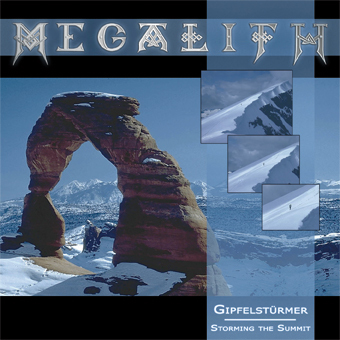 Just like the previous effort, “Gipfelstürmer / Storming The Summit” is a somewhat controversial, but very interesting album with variety and quality in the music, depth in the lyrics and only lightly veiled social criticism that will make you think (if you understand German, obviously), resulting in one of the year’s highlights that is original and stimulates your mind in more ways than one.